Considering recent CFDA Award nominee Pamela Love's impossibly cool goth-chic jewelry, we were surprised to find graphic, textured elements among her inspirations this month instead of talons or hearts. Love surprised us with an inspiration board that favored layers of broken texture and neutral tones over anything so literal or obvious. 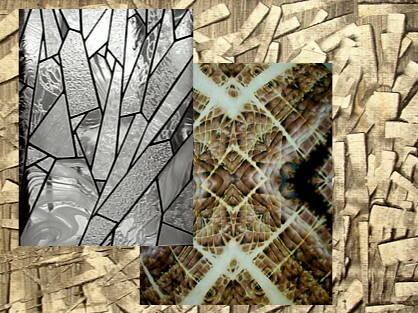 Shards of shattered glass, piercing patterns and naturally-occurring geometries are influencing Love's style this spring. And while each image appears to depict something broken, there's no arguing that the overall effect is soundly chic. (In the Background) Mikhail Takhanov, "Abstract Composition," 1932: "I love the way these shapes look like they're piercing each other and yet seem so light at the same time." Carter Smith, "Brown Geometric Geode": "This image has a great color and depth to it as well as maintaining a geometric pattern that i was really attracted to." Upon first viewing this image, we were struck by its resemblance to butterfly wings seen through a microscope during high-school science class. Shattered Glass, from "Art Deco and Abstract Arts": "I love how comfortably these sharp shapes mix with the softness of the glass."